This 5 in 1 heat press machine with 2in1 digital controller is out now. This swing-away heat press boasts all of the must-have attachments. This includes flat platen, mugs and plates. It can transfer colorful pictures and characters of sublimating and dissolved printing ink onto ceramics, glasses and textiles such as cotton, flax, chemical fiber, nylon, etc. Fahrenheit and Celsius scale are selectable. Adjustable multi-spring balancer. Allows pressure to be more evenly distributed across the entire platen when it is closed. 4/5" thick heating board. Built-in structural support to maintain flatness. Warm up quickly. Offers even heating. Upgraded aluminium alloy cradle. Detached cradle for use of the mug elements. Compact size and lightweight, as compared to standard mug cradles. FEATURES: Brand new 5 in 1 heat press machine. Large 12" x 15" transfer element. Provides a big surface to create your own custom T-shirt. Digital LED controller. Temperature: set the desired temperature. Timer: set the desired time. Intelligent audible alarm after the transfer done. Full 360-degree rotation of swing-away design. Allows the heating element to be moved safely aside. Full-range pressure-adjustment knob. Can be adjusted according to the thickness of the material. Teflon-coated platen press element. Non-stick surface. Prevents scorching of transfers. Awfully simple operation. Draw down the handle and wait until it alerts. 2 4/5" Long arm handle. Comfortable rubber grip for everyday use and long production runs.Removable silicone pad and cotton pad. Detachable lower platform. It is elevated with dual supports. Easily exchange to other elements. Metal and plastic construction. Built-in fuse for safe using. Adjustable feet for unevenly floor. CE certification.PLEASE SEE MY OTHER LISTINGS! THANK YOU. Power input: 110v - with US-standard grounded plug. Wattage: 1000W. Temperature range: 32 - 430 Fahrenheit degree (0 - 250 Centigrade). Timer control: 0 - 999 seconds. Cord length:4.5'. Adjustable height 13 1/2" to 17". Dimension (w/ platen press): 15 1/4"L x 15"W x 17"H.
Five Elements: Platen Press (telfon-coated) - 12" x 15", Hat/Cap Press - 6"x 3"( curved ), Mug Press - 3"-3.5" diameter ( 11oz ), Plate Press #1 - 5" max diameter, Plate Press #2 - 6" max diameter. 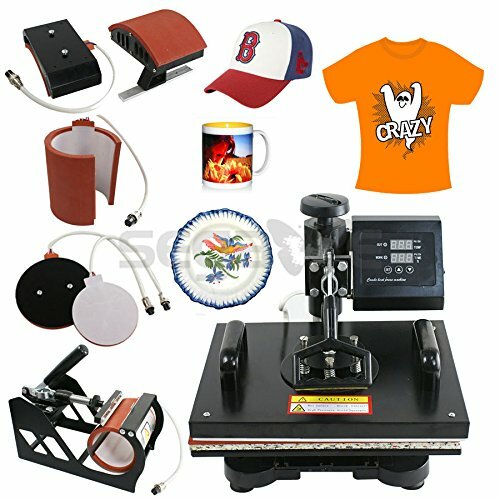 Package Content: 1x Fully-assembled machine with platen press, 1x Hat press, 1x Mug press, 2x Plate presses, 1x Silicone pad, 1x Cotton pad, 1x Manual, T-shirts, cups and hats are NOT included.